With St. Patrick's Day coming up, “After Hours,” a series showcasing faculty and staff who are passionate about their activities beyond the work-a-day world, explores the fun of playing traditional Irish tunes in a pub. 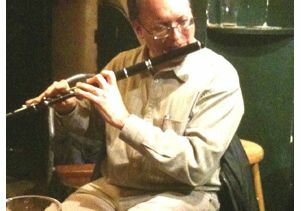 Meet Tim Taylor, who, with his flute and encyclopedic knowledge of hundreds of Irish tunes, is welcome at any Irish pub around the world. Hear Tim Taylor perform by clicking the arrow. Timothy Taylor. Photo by Bjarne Rogan. Second Life: A fluter with a passion for traditional Irish tunes who plays at a bar in Long Beach, the Auld Dubliner, about 30 Sundays a year. Tracing his roots back to Land of the Blarney Stone: “The University of Michigan, where I went to graduate school, had an exchange and fellowship program with several European universities, including the Queen’s University of Belfast. I wanted to go partly because my ancestors came from Northern Ireland to America during the Irish potato famine in the 1850s, and no one in my family had been back. 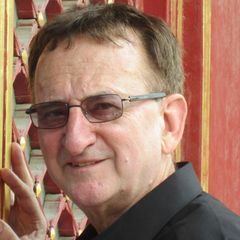 But mostly, I wanted to go because they had an important scholar, John Blacking, with whom I wanted to study ethnomusicology. So in 1988, I went to Queen’s University of Belfast. I was only in my third year of grad school. Queens had a small music department, so everybody did everything. I played in the orchestra as a classical clarinetist, and I sang in the choir. Keep 'em dancing: “There are hundreds of tunes, all very short at about 20-30 seconds long, So you repeat a tune several times, because this music is meant to accompany dancing, and they’re dancing for several minutes at a time. Then you immediately go into another tune without stopping. Playing for the joy of it: “Inside Ireland and out, the place you’ll hear this music is in a bar — usually an Irish bar where musicians are made welcome, and we just show up and play. It’s not really a performance; there’s no microphone. We’ll sit in a circle, so some people will have their backs to the rest of the people at the bar. We don’t call it a gig or anything; we call it a session. Sometimes somebody will just start dancing.